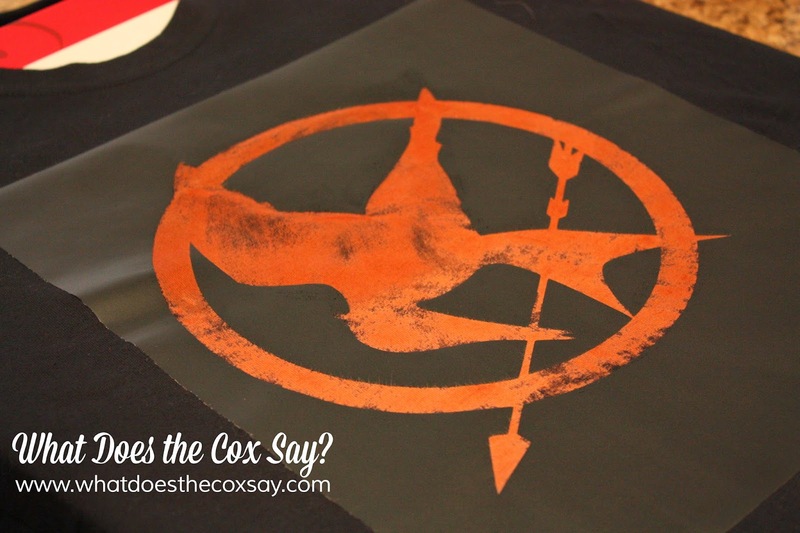 What Does The Cox Say? : Bleach T-Shirt with a Twist! I'm sure you've seen the bleach t-shirts ALL OVER the internet. You know the kind I'm talking about. The ones that somebody put bleach in a spray bottle and sprayed the heck out of it to get their design to show through. For me, I liked the concept but I didn't exactly love the way they turned out. I wanted to make a t-shirt for my nephew for his heart gift for Christmas 2012 but I wanted it to be more polished. I thought Vinyl would be ok, but I really wanted it to look more professional. I wish I would have taken an after picture! But you get the idea! It seriously turned out legit! I will be making my son a Star Wars Logo one soon. This may be a great idea for a graduation gift as well! Here's what I did. I cut out a shape on my personal cutter. If you don't have one you could always print out your design and cut it out yourself and trace it onto the back of the vinyl. I highly recommend using Vinyl as your stencil because the bleach doesn't seep under it. cardboard to use as a barrier for the shirt. I put the cardboard in between the shirt and then I placed my Vinyl where I wanted the design to be. From there I put a little bit of bleach in the cup. Beware of the fumes. I dipped my foam brush in my cup and started blotting the bleach on my design. It's important to make sure the bleach soaks in, but work quickly! You don't want it to sit too long on your shirt because as it sits it could cause holes in your fabric. I seriously let my bleach sit about 30 seconds then rinsed it off in the sink. From there, I took off the vinyl and tossed my shirt in the washer and washed and dried it. And that's it! The shirt turned out AMAZING and I have to be honest, I think it was my favorite heart gift I gave this year! If you make one you'll have to let me know what you think! Have you ever made a bleached shirt before? What design did you use/what design would you use if you make one? Thanks girl! I'm pretty happy with it! I have realized that with letters it gets a little tricky and it's important to not use too much bleach! Otherwise it will bleed under the vinyl! You will have to show me what you decide to make! Cool!! Do you think it would work with freezer paper? Wow - that looks so good! !